Designer drugs are congeners of active compounds that have been modified from legitimate pharmaceutical agents, and are used for recreational purposes. Designer drugs are congeners of active compounds that have been modified from legitimate pharmaceutical agents, and are used for recreational purposes. Apart from amphetamines, there are several other groups of designer drugs (Table 16.2), which have been discussed in detail elsewhere. Designer drugs are usually stronger and cheaper than the parent compound, and can be easily synthesised in clandestine laboratories. The term routes of old drugs (e.g. cocaine used in freebase form, i.e. “crack”). It also does not include legal drugs which are abused (e.g. ephedrine, caffeine, phenylpropanolamine, etc.). enedioxymethamphetamine, which was introduced by E Merck and Company in Germany in 1914. However, it was never marketed. It was only in the 1970s and early 1980s that it made its appearance as an “underground” drug. * Since 1983 it has become increasingly popular among adolescents and college students as a recreational drug to be used during “rave parties” which are extended dance parties often lasting all night long. The other designer amphetamines (Table 16.2) quickly followed and are mostly available as gelatin capsules or loose powder for ingestion. They have made their way into India in the late 1990s, and are quite openly abused by college students from affluent families. While designer amphetamines share a number of properties with the original amphetamines, unlike the latter, they are potent releasers of serotonin. Chronic administration can result in permanent damage to serotonergic neurons. Methylenedioxymethamphetamine (MDMA) was used in the early years following its synthesis, by psychologists to enhance psychotherapy. Today, there are no legal uses for any of the designer amphetamines. · Designer amphetamines are abused by teenagers and young adults for inducing euphoria, facilitating intimacy and verbosity, and heightening sexuality. Users of MDMA report that it “expands consciousness” without making them lose control. Sometimes these drugs are labeled “entactogens” for their alleged ability to increase sensitivity to touch, or “empathicogens”, for their alleged ability to create empathy, especially before sexual encounters. MDMA is considered an “entheogen” which means “to become divine from within”. Entheogen refers to a state of shamanic or ecstatic possession induced by ingestion of mind-altering drugs. 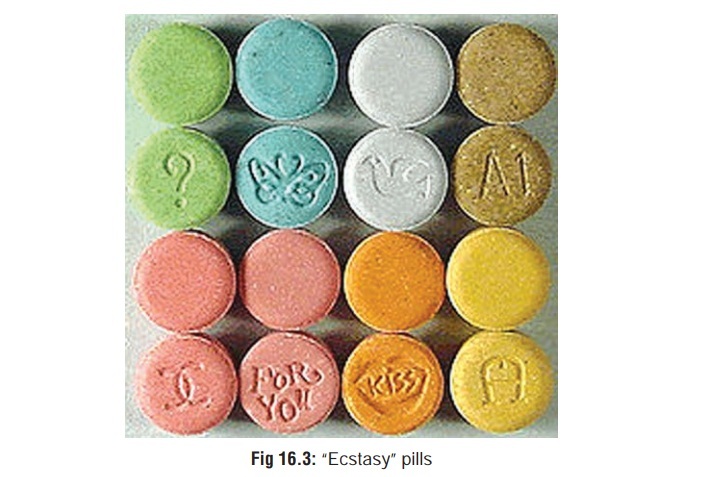 · “Candyflipping” refers to the intentional combination of ecstasy with LSD. Another method of use is called “stacking” in which 3 or more tablets of MDMA are taken at once; or MDMA is mixed with alcohol, cannabis or some other drug (ketamine, GHB, cocaine, etc.) in order to modify the “high”. Stacking can increase the risk of overdose, since MDMA, acting as a stimulant, can mask the sedative effects of alcohol or any other drug. There is current vogue for combining ecstasy with sildenafil to enhance sexual pleasure (“sexstasy”). · Effects are seen 30 to 45 seconds after ingestion (on an empty stomach) in the form of a ‘rush’, which lasts 15 to 30 minutes. This is followed by a sense of clarity and joy. A booster dose may be taken at this point, to prolong these feelings. About ½ hour to 3 hours after the initial ingestion, a “plateau” phase occurs in which repetitive or trance-like movements become extremely pleasur-able. The “coming down” phase occurs 3 to 6 hours after the initial ingestion, and can lead to negative feelings or emotions (depression, anxiety). Symptoms may persist for several days. · Acute toxicity results in nausea, anorexia, anxiety, mydri-asis, hyperthermia, muscle rigidity, trismus, sinus tachy-cardia, sweating, tachypnoea, cardiac arrhythmias, cardiac arrest, metabolic acidosis, rhabdomyolysis, myoglobinuria, acute renal failure, and disseminated intravascular coagula-tion. The following have also been reported: convulsions, cerebral infarcts, hallucinations, paranoia, chest pain, hyperkalaemia, and fulminant hepatic failure. Pulmonary oedema and ARDS may occur in severe intoxications. Coma may develop in severe cases. · Chronic use results in anorexia, weight loss, exhaustion, jaundice, irritability, flashbacks, paranoia, depression, or psychosis. However, since frequent use diminishes the pleas-urable effects of these drugs, users often taken them only at intervals of 2 to 3 weeks, and then gradually lose interest and stop intake altogether over a period of time. * There appear to be no reports of individuals who take excessive doses of these drugs frequently over an extended period of time. · Ecstasy has been associated with cardiovascular and muscu-loskeletal malformations in babies exposed in utero. Treatment measures are essentially the same as for all ampheta-mine poisonings. · Amphetamines are the most widely used illicit drugs (second only to cannabis) in the United Kingdom, Australia, and many parts of Europe. Significant abuse also occurs in the USA. After the introduction of amphetamines into clinical use in the early 1930s, they were available as prescription drugs for various indications (obesity, narcolepsy, attention deficit disorder, psychotherapy), and even sold over the counter in the form of nasal inhalers till the early 1970s. Since then their pharmaceutical use has been greatly curtailed, though many of these drugs are still available (under restric- tion) in Western countries. They are virtually banned in India. · Japan experienced an epidemic of intravenous metham- phetamine abuse in the years following the Second World War. Crystalline methamphetamine (“ice”) was introduced in the 1980s in Hawaii, and quickly became popular in other countries. · Today, designer amphetamines are a rage among adolescent party-goers, and are used extensively in the course of “rave parties”. This fad has now gripped several metropolitan Indian cities where tablets of Ecstasy are available freely among elite circles (Fig 16.3). Much of this popularity has to do with the copious amount of information existing on these drugs on the Internet, and the fact that unlike certain other drugs like heroin and cannabis, designer drugs are considered “hep” and “cool”. Also, unlike many other hard drugs, designer drugs can be easily consumed (ingested) without the messiness of nasal insufflations, smoking, or injection. · Adulteration of MDMA tablets may be done with oriental herbal ephedrine (Ma Huang) or ketamine. · Paramethoxyamphetamine (PMA, "death") a ring-substi- tuted amphetamine (methoxylated phenethylamine deriva-tive) has been fraudulently marketed as MDMA, and has caused several deaths.